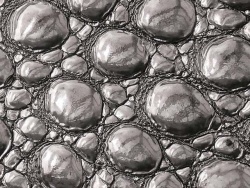 Embossing is the art of producing raised patterns on the natural grain of an animal skin. The design is created by pressing rolling, or stamping. 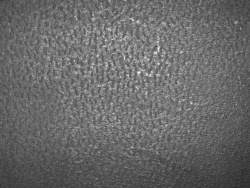 Embossments can cover the entire surface of a skin or just selected areas. Blind Embossing, blind printing, blind finishing: Embossing of leather without colour. Gold embossing: The transfer of gold leaf into the embossing. Colour imprint: The transmission of colour by colour films in the embossment. Different embossing on book covers: Blind Embossing - Gold embossing - Colour imprint. The amount of pressure used to stamp the tools into the leather -> The higher the pressure, the stronger and more durable the embossing. The time required for the stamping -> The longer the stamping pressure, the stronger and more durable the embossing. The temperature used -> The hotter the tool, the stronger and more durable the embossing. The moisture content of the leather -> Imprints in damp leather are clearer and more durable. Prior to embossing, leather may be bonded with foam and lining on the back so that the embossed pattern sits neatly and retains its depth. 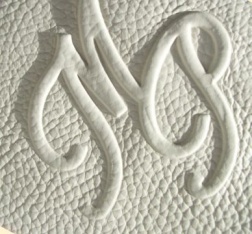 Sometimes a fabric is glued to the back to prevent stretching and flattening of the embossed motif. Deeply imprinted motifs need to be stabilised with fillers. There is a wide variety of filling materials that can be used, from papier mâché to hot glue, but the decisive factors are their stability and flexibility. 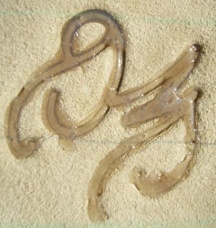 Embossing after pigment colouration. The fold was not embossed. 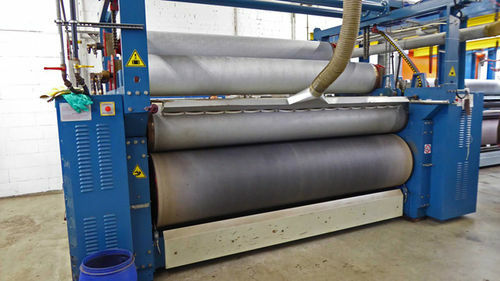 Roller of an embossing machine in a leather factory. 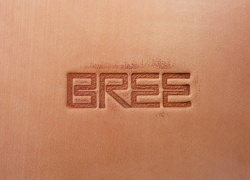 Embossing plates: coarse grain leather and pig skin grain. Crocodile pattern by embossing plate. 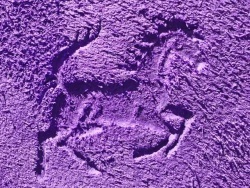 Embossing stamps are sometimes milled. 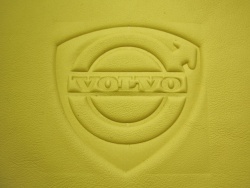 - VOLVO-Logo embossed in car leather (www.ledermanufaktur.com). 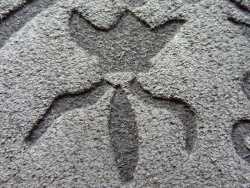 A specialist for leather embossing stamps: www.les-graveurs.de. 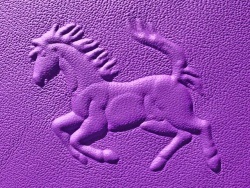 Embossing in the imitation leather of a Ford Mustang. 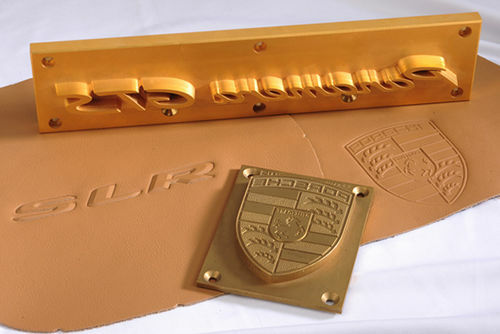 Car leather can be branded by embossing, by embroidery or by printing. 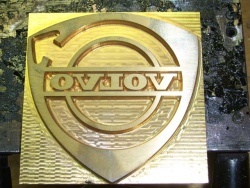 Due to the longer exposure time at a hydraulic press, the embossed motif is more stable than if it was applied with a roller. 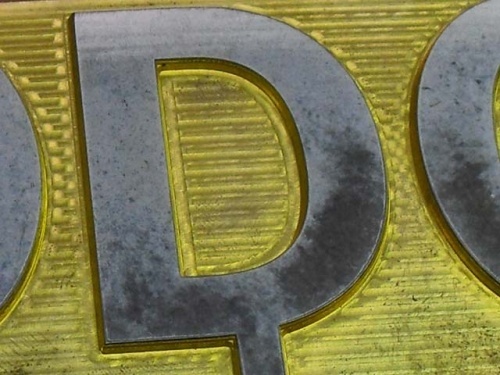 Depending on the temperature, pressure and length of time, the embossing is more or less clear and stable. Moisturising the leather afterwards stabilises the motifs. The process needs to be fine-tuned to achieve good results. Too hot embossed aircraft leather is not good enough for "First Class". Embossing rollers and embossing stamps are expensive. 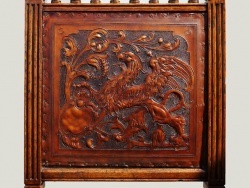 Individual motifs are therefore often carved. 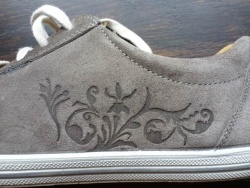 It is also possible to create motifs on leather with lasers. 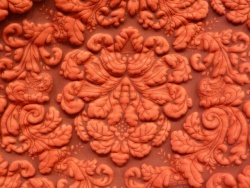 Embossed lamb leather used for clothing. Beautiful embossing on a strap made of elkskin leather (Pineyard - MUD GbR). Almost any type of leather can be embossed. However, the embossing must be adjusted, depending on the type of leather. 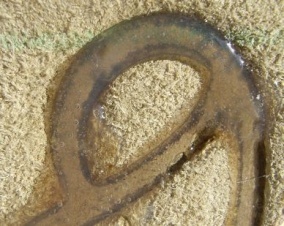 The resistance of an embossing depends on the embossing process. The higher the pressure and the temperature, and the more moisture in the leather, the more permanent the reshaping of the fibre. But, of course, there are also limits to the pressure and temperature that can be applied to each leather. Often, leather is decorated to achieve a certain look. The grain structure of other animals can also be copied. 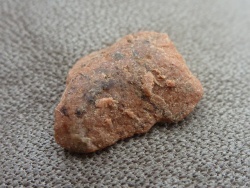 It is sometimes difficult to distinguish even for experts if the grain structure is from the original animal or only an embossed copy. A video about painting on leather, perforating leather, carving leather, embossing leather and several other methods to create motifs on leather. Embossed leather belt. Embossed seat cushion. 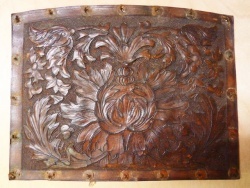 Embossed antique weapon shield. Embossed case. 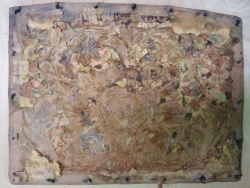 Embossed and decorated with paint. 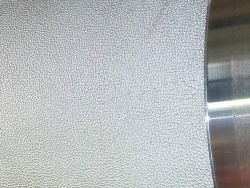 Embossed skin structure of ostrich leather. 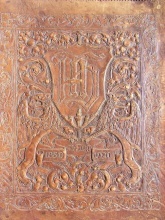 Embossed antique leather. Beautiful motif. Very finely worked. Antique leather folder from 1920 with beautiful embossing. 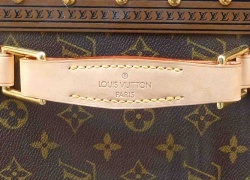 Leather handbags producers like to brand by embossing their company logos. Antique leather chairs are often decorated with a beautiful motif. Modern patterns embossed in cow leather. 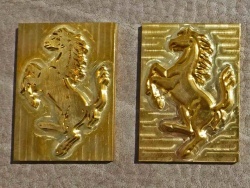 Front and back of horse motive embossing. Horse stamping tool positive and negative as pictures above. 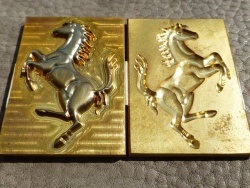 - Two other variants of horse motifs. Usually, embossing is done on the grain side by compressing the leather grain structure. The uncompressed leather fibres remain above. This creates a three-dimensional effect. 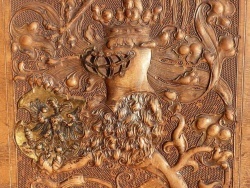 Leather is sometimes embossed with two embossing plates from both sides (positive and negative). 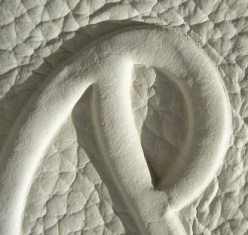 Then the recesses on the back must be stabilised to prevent the embossed motif from pressing down during use. Strong embossments in soft leathers are stabilised from the back with a silicone filling to prevent the embossing being pressed down from the front. 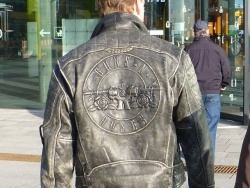 Back stabilised embossing of leather jackets. Antique Leather with a wax-based reinforcement (wax mixed with sand) at the back. Very exotic: Cow leather with an extremely strong embossing and metallic effect. Unusually strong deformation of furniture leather. 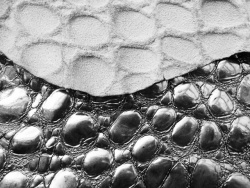 Crocodile embossing in imitation leather. 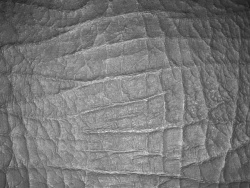 Another reason for embossing hides is to obscure natural markings on leather. Therefore, the surface is sanded and repaired before embossing. Such leather is called ‘corrected grain’. A farmer doesn’t get any more money from the butcher for his cows and cattle, if the skin is flawless. During their lifetime, animals suffer wounds and marks that affect the quality of the leather surface. 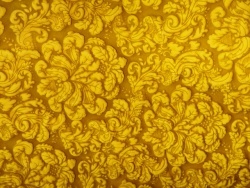 Embossing is used to hide insect bites, injuries, illnesses and other damages on animal skins and to create a uniform grain. 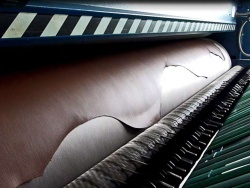 This reduces wastage, as the entire surface of a skin gets a uniform grain pattern. 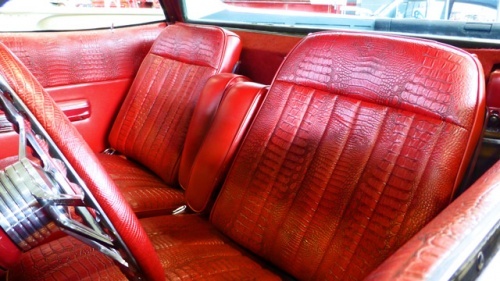 All parts of a set of furniture or car interiors will be identical. Minor flaws and irregularities of the natural grain can be balanced and must not be circumvented when cutting the leather. A natural leather grain varies across the skin surface. In the middle of a skin the leather is mostly fine grained, while towards the edge it has a coarse grain. When cutting seating surfaces for furniture and vehicles, the customers value a uniform grain structure. Due to the uniform embossing, the grain structure is identical across the hide. On one hide: fine grain - transition - coarse grain. 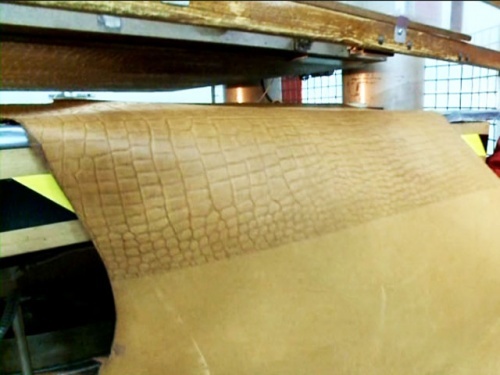 For any tannery, the scale of costs depends on the number of hides which can be used. 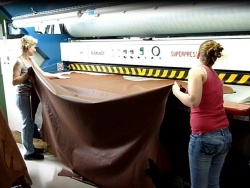 Skins that are not good enough for processing as full-grain leather can be embossed. Only about 10-20% of the hides coming from the slaughterhouse are ‘good’ to ‘very good’ quality. 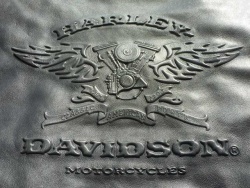 Embossing does not reduce the quality of the leather. Provided that it is not hiding damage that could affect the life expectancy of the leather, embossing is perfectly acceptable. Unembossed leather. - The hair pores are still visible (click to enlarge). In preparation for embossing, the leather is mostly sanded to obtain a uniform structure. Such leather is called ‘corrected grain’. It is cheaper and feels colder and plastic like. The breathability of such leather is significantly lower when compared with porous leathers. There is also leather which is only lightly sanded making it soft and warm to the touch. But this is more the exception. Embossed and sanded leather. - The hair follicles are sanded away and over embossed. 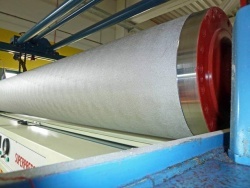 The sanding stage prior to embossing is sometimes forbidden by car manufacturers to prevent the use of lower quality hides. Embossed, but not sanded leather. The hair pores are still clearly visible. 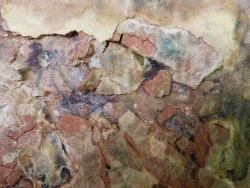 Car leather from BMW with "Montana" embossment. - Strong embossed furniture leather. - BMW with "Picasso" embossment.